Successfully Added Bluetooth Watch - Up To 12 Months Battery Life, Call Reminder, Message Reminder, Pedometer, Social Media Reminder, IP67 (Black) to your Shopping Cart. This stylish little Bluetooth watch can be easily paired with your iOS or Android phone through the dedicated mobile application. Once synchronized, it allows you to receive call, message, and social media notifications. This will significantly increase your connectivity on the go as, from now on, you’ll never miss out on an important message or phone call again. Thanks to its stylish and casual design, this Bluetooth smart watch can be worn with confidence at any given occasion. Whether you use it at the gym or at work – the watch is sure to match your outfit. 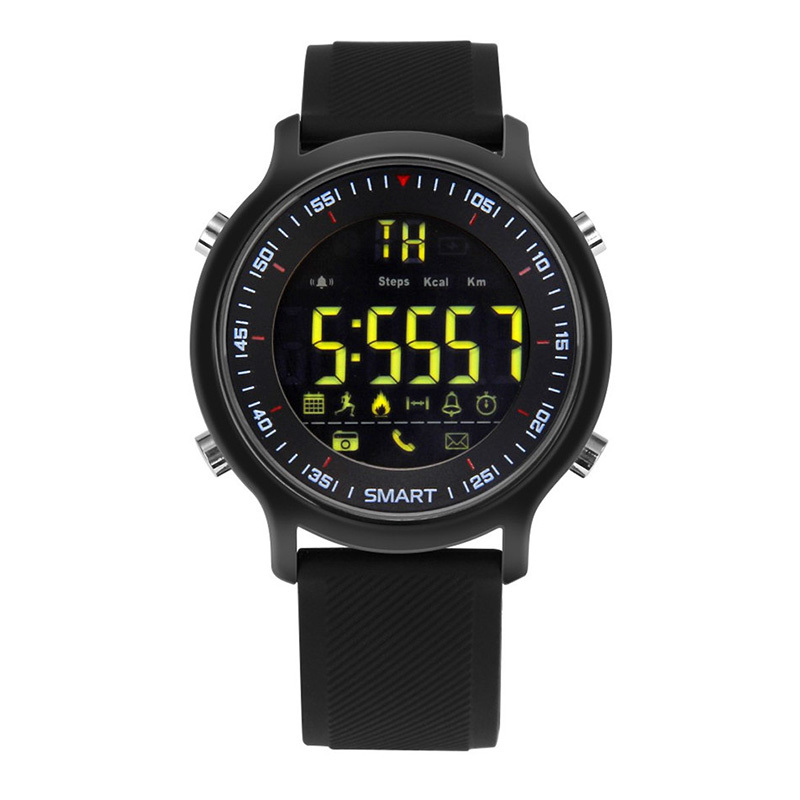 The Bluetooth watch features an IP67 waterproof body. Thanks to this, you’ll be able to use it in any environment and weather condition. You won’t have to worry about it getting in contact with water, dust, or dirt. With its backlit display, your smart watch can even be used at night. Your Bluetooth watch features a 10m range, bringing along great mobility. Thanks to its energy saving design, you’ll be able to use all the watch’s features for up to 12 months without needing to recharge your battery. Besides providing notifications, your smart watch also comes with several health features. With its pedometer, it allows you to keep accurate track of the number of steps and distance you cover throughout the day. This allows you to analyze your activity levels to make sure you’ll always reach your daily activity needs. Your watch saves data for up to 21 days, bringing along the possibility to analyze your improvements throughout the past month. With this sports watch at your wrist, you’ll always stay motivated to keep on moving in order to meet your future fitness goals. This smartwatch comes with a 12 months warranty, brought to you by the leader in electronic devices as well as wholesale electronic gadgets..